OLB #37 Vaness Harris – Sr., 6-foot-2, 255 pounds – Harris started the first seven games of 2012, but was replaced by Largent in Week 8. He didn’t lose the job because of poor play, however, as it was simply due to the stellar play of Largent. Expect Harris to compete with Largent for the starting spot, but understand that both will still see significant playing time with Rocky Long’s tendency to rotate defensive players. Harris could arguably start for most teams in the country, and will still put up impressive numbers whether starting or not. MLB #46 Jacob Driver – Sr., 6-foot-2, 220 pounds – With backup middle linebacker Rob Andrews gone, someone will need to step up to split time with Fely. Expect Driver to take on that role in his final season with the Aztecs, as he will be motivated to finish his collegiate career with a solid senior campaign. MLB #38 Scott Graves – Sr., 5-foot-10, 210 pounds – With a loaded linebacker core, expect Graves to play a backup role but also make an impact once again on special teams next season. Graves was named the team’s Special Teams Player of the Year last season, and will continue to play an integral role and be a special teams guru for the Aztecs. If any of the linebackers in the two-deep go down with an injury, he will be more than ready to step in and fill the void. OLB #54 Micah Seau – RS Fr., 6-foot-3, 235 pounds – Keep an eye on Micah Seau, nephew of the late Junior Seau, as he tries to make an impact for the Aztecs next season. He possesses great size and loads of talent, but he lacks the experience the other linebackers have. Another year of development might be needed for the young linebacker, but don’t be surprised if he is able to break through and find his way onto the field. Due to the depth at the position, don’t expect any of the incoming linebackers to see playing time in 2013. Tyler Morris, Randy Ricks and Calvin Munson are three high school commits expected to play linebacker, but all three will benefit from using a redshirt year to develop as they gain strength and size. If 2012 taught us anything, it’s that, contrary to popular belief, Jake Fely is not too small to play middle linebacker. Fely was nothing short of spectacular in 2012, flying around the field and making plays every time the Aztecs needed them. After being named the team’s Defensive Player of the Year in 2012, Fely will continue to play at a high level next season, proving to doubters that his heart and ferocity outweigh any size concerns. Another pleasant surprise in 2012 was Largent, a junior college transfer who came out of nowhere and stuffed the stat sheets, doing everything he could to help the defense succeed. Expect an even bigger year from Largent in 2013. In addition to Fely and Largent, San Diego State has five senior linebackers, making this group arguably the strength of the defense. Tenhaeff and Harris, two seniors with the most experience among the linebackers, will look to have strong senior seasons, and both will contribute greatly to the Aztecs. San Diego State had two all-conference linebackers in 2012, as Fely was named to the second-team and Largent was an honorable mention. 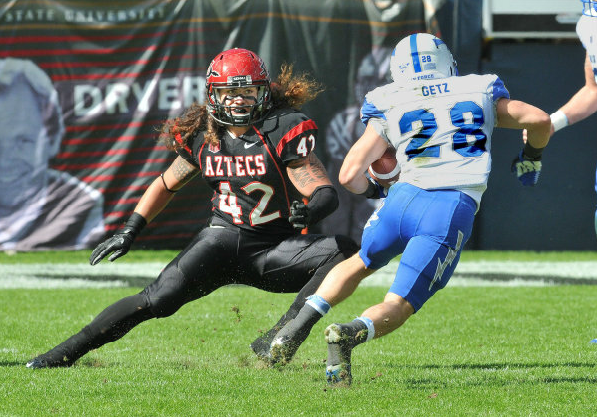 In 2013, three Aztec linebackers will be all-conference selections. Missed that. Thanks for the heads up. Great job on keeping us informed and thanks for the size and weight stats. It’s looking like we may have a stout defense next year. What would you say seems to be our weekness on this defense so far as the positions are concerned? I’m thinking it may be the defensive backs, though if the “front seven” can deliver it may take some pressure off of them, what say you? Wouldn’t mind your thoughts on the pros and cons of MWC vs BE conference. All of the safeties return, which will help, but it is uncertain who the starting corners will be. It will also help having a solid front-seven, because the more pressure they can put on the quarterback, the less time the cornerbacks need to stay in coverage. Stay tuned tomorrow for an in-depth preview of the cornerbacks! As for MWC vs. BE, that’s a whole ‘nother story. That would take a long time to write about! Sorry for the late response, Matt, but neither Wade or Sandifer will be eligible for a sixth year of eligibility. Both will be gone. hey there and thank you for your info – I’ve definitely picked up something new from right here. I did however expertise some technical points using this website, as I experienced to reload the web site a lot of times previous to I could get it to load correctly. I had been wondering if your web hosting is OK? Not that I’m complaining, but sluggish loading instances times will very frequently affect your placement in google and can damage your high quality score if ads and marketing with Adwords. Well I am adding this RSS to my e-mail and could look out for a lot more of your respective interesting content. Ensure that you update this again soon.